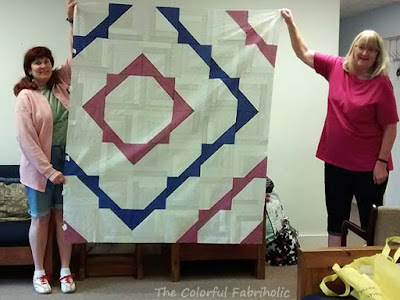 Whoo-hoo, the quilting is finished! This is not bound yet, and it's just stuck to the door here with visible magnets, but you get the idea. The original plan was for it to hang on the back of a door, but my son decided it would be safer for the real ornaments if it hangs on a wall. I'll add sleeves top and bottom before I bind it, so the sleeves will be caught in the binding seams. Then after it's bound I'll add the thread loops for hanging the ornaments. The tree itself is quilted along the seams, and the background is horizontal lines, presser foot-width apart. These triangles and rows finish 3" high. I'll add the thread loops at the triangle intersections so there will be lots of places where they can hang ornaments. Linking up with Sarah's Whoop Whoop Friday - check out what everyone else is celebrating over there. I've been procrastinating. My least favorite part of any quilt is crawling around on the floor pin-basting the layers together. I've particularly been procrastinating over this one because I thought I would Frankenbatt some batting pieces together. But none of my scraps were good sizes that would work without generating even more, less useful scraps. I ended up cutting one piece from my new bolt of nice batting. Then I spent the morning pressing the backing and the top, layering, and pinning. My knees are not happy. 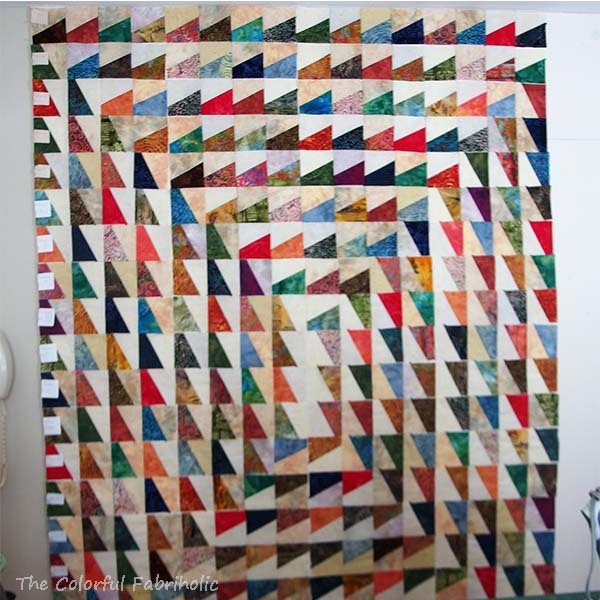 My goal is to get this quilted and finished this week. I can get that done, don't you think? A couple weeks ago some of the Sew Bee It girls got together for a sew day, and I was reminded that our guild's charity efforts this year are Little Dresses For Africa. One of the girls was working on hers; she's generously making multiples in cute bright splashy floral prints. We were encouraged not to use white which would show dirt, so I had to find something in my stash that would be suitable and which I had enough of. I ended up using a coral stripe, a green vine, and a blue marble. Actually finding something large enough in my stash was a challenge. 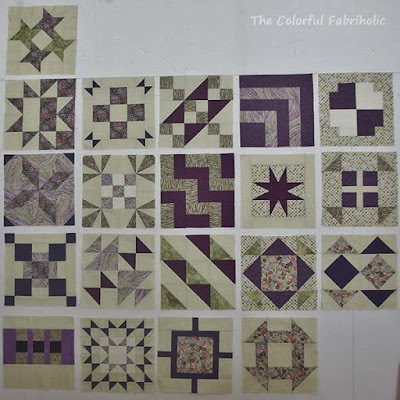 I didn't want to cut into large lengths of yardage planned for backings, and other than backings I usually collect half-yards or FQs of fabric. 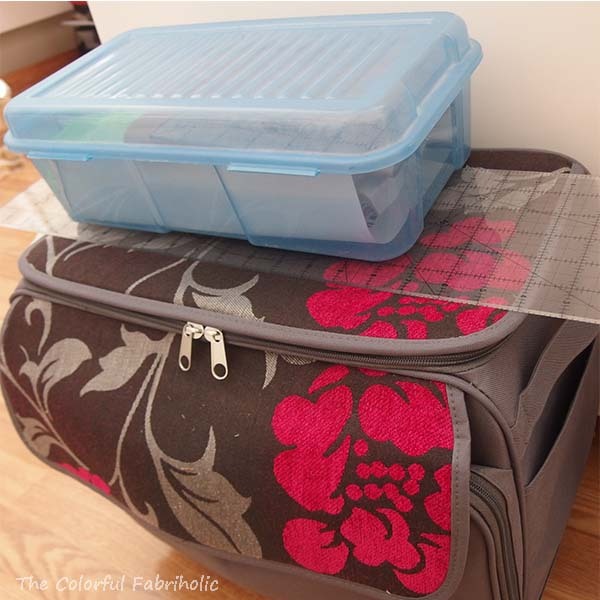 The minimum length of the size small (2-4) needs at least 5/8 yard. The medium (6-8) needs at least 3/4 yard. 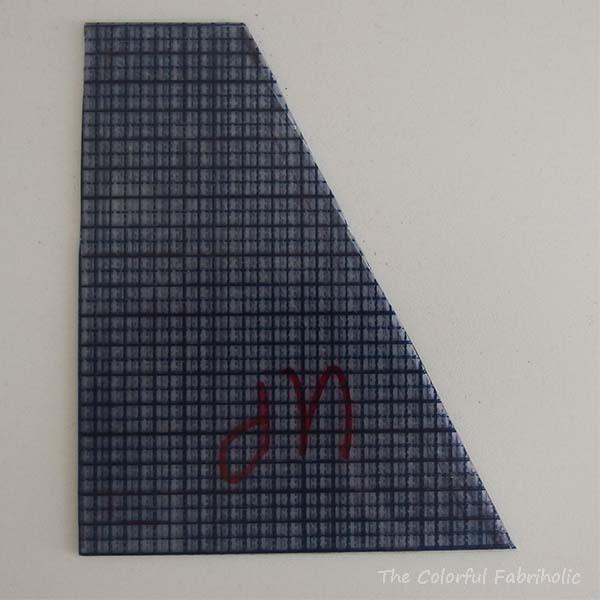 All sizes are supposed to use the full width of fabric. I had enough of the green to make a Medium, no problem. But then I got stuck. I had just enough length of the coral and the blue for size small, but I didn't have full width of fabric; I had about 36-38". But I figured that should be enough girth for a toddler. After all, full width of fabric - 42" - is big enough to go around my bustline, and I'm certainly much larger than any toddler. So 36" in girth should be sufficient for a small child. 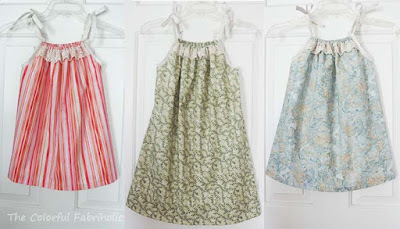 I labeled the coral and blue dresses size Small Slim in case it matters. These were fast and easy to make. I found a piece of ecru lace and added some to each dress. A little extra touch of prettiness can't hurt for these children, right? So today I'm whooping about my Little Dresses and linking up with Sarah at Confessions of a Fabric Addict. Since late December I've been participating in Pat Sloan's "Solstice Challenge." I've kept up with making a block a week for 25 weeks, although I've modified some of them to suit me. So here we are at the Summer Solstice, and all my blocks are done. Here are all 25, in order. Some I like much better than others. Some don't play as nicely with the rest as they should due to my value choices. I'm planning a layout that will use 20 of them, so I can omit the ones I like least. I also have one additional block that I could include, made in this palette when I tested some die-cutter dies. 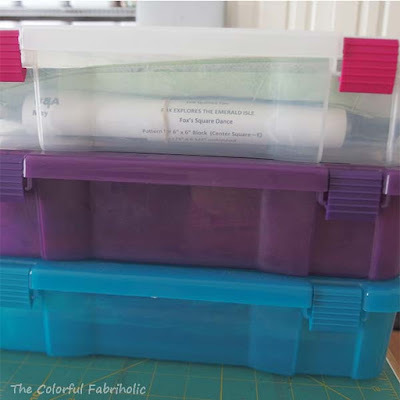 I don't have enough of anything in my stash that goes with my palette for the dark sashing strips, so I will have to buy something. 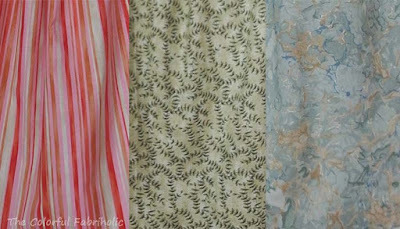 I'm hoping I can eke out the light sashing strips from the background fabric I have left. If not, I'll have to figure out plan B. 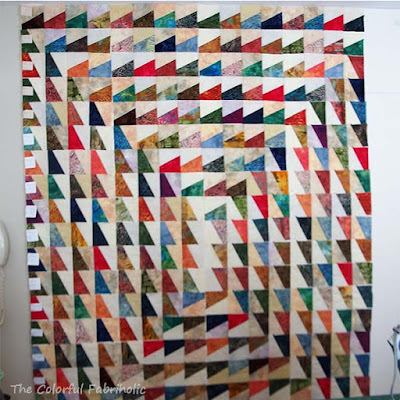 This quilt will finish at 75" x 90". No deadline and no particular recipient in mind, and I have deadline projects that have to come first, so I'll have to set this project aside and come back to finish it later. IN so far this month: 0 - and I spent all day last Saturday at a quilt shop! 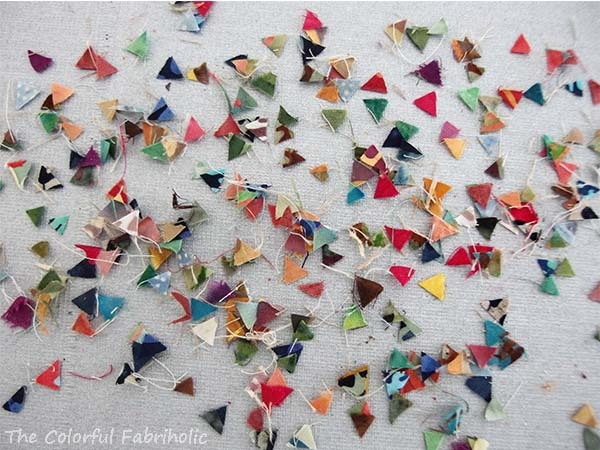 Awhile back I was inspired by this photo Wanda of Exuberant Color posted. Thanks, Wanda, for the inspiration! 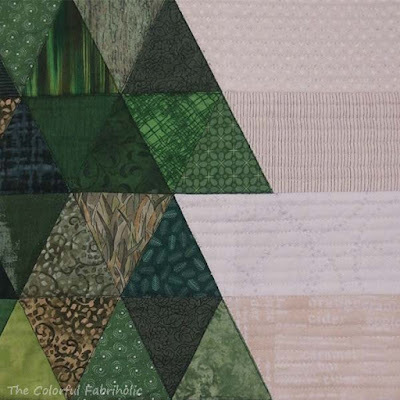 I made a template, dug into my batik stash, and cut lots of pieces. I used them as leaders & enders while I was working on several projects in March, April, and May. And then they took on a life of their own and I had to finish up all the little units and lay them out. Wow, I am so pleased with the result. If you start at the center you can see that the lights (or the darks) go around in a spiral, with a couple extra rows at the top and the bottom. This flimsy measures 64" x 84". I made the template for 4" finished units by drawing a 4" square on template plastic, drawing a diagonal line from the 1" mark at the top to the 3" mark at the bottom, and adding 1/4" seam allowance on all four sides of the resulting shape. To use it with a rotary cutter, I cut six of these pieces, stacked them up, and glued them together with glue stick. With care it's thick enough that you can rotary cut, but you have to be careful not to nick the plastic too much. 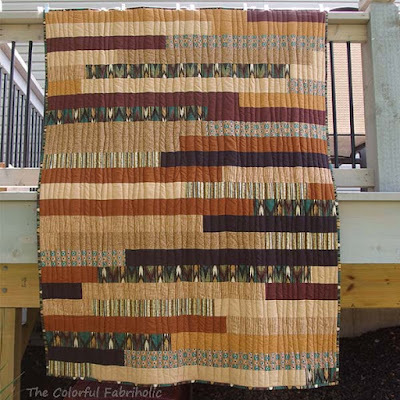 I cut 4-1/2" WOF strips from light and dark batiks, opened them all face up (some batiks have a right and a wrong side), stacked about 4 layers of fabric, and cut as many pieces as I could across the row. 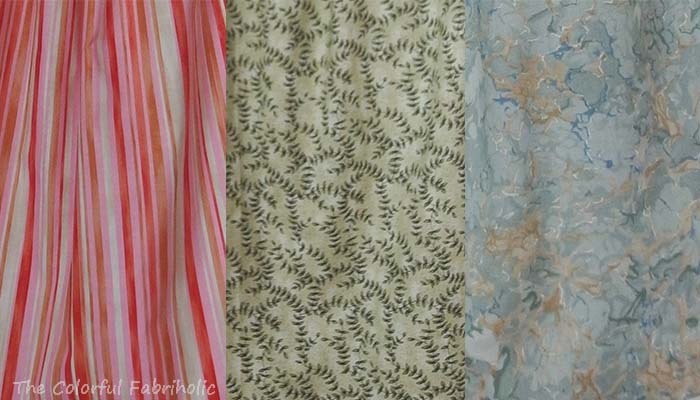 I didn't keep a record of how many different fabrics I used, but I know they hardly made a dent in my batik stash. 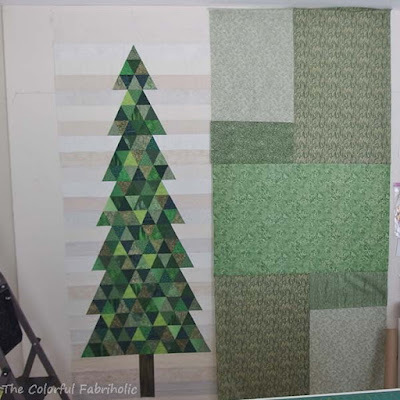 Note: If you try this, mark your template UP and always cut your fabric right side up, otherwise you'll get blocks with the slant going the wrong way. You can rotate the template as you cut, but don't flip it over. You might also want to clip your cut pieces together with a note on them to indicate which side is up, if you're using them as leaders and enders. I made a few where I couldn't tell the right side from the wrong side, sewed them wrong sides together, and they came out backwards. 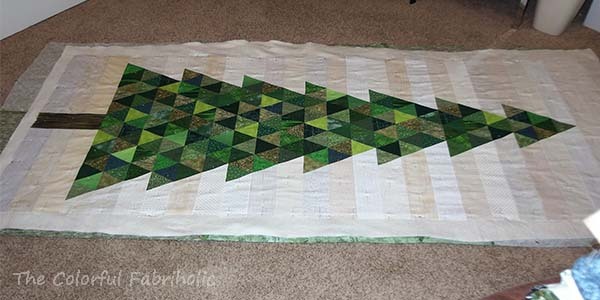 This flimsy is going to have to go in the "to be quilted" pile for awhile; I have deadline projects that I have to finish first. I don't have a purpose or recipient in mind for this quilt, but I like it so much I may just keep it for myself. 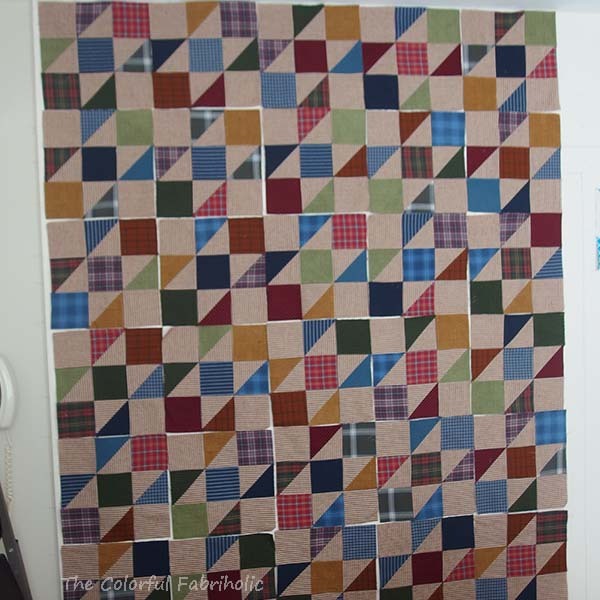 At the sew day this weekend I was able to finish making all the blocks I need for the flannel plaid project. I put them up on the wall so I can arrange them. The layout will be five blocks wide by seven blocks long, 60 x 84", and obviously some of the blocks need to be moved so the color placement will be more balanced. I don't like working with flannel. It's stretchy, it doesn't press very flat, and it sheds lint everywhere. But DH requested a flannel quilt, and some of these plaids are from his old shirts. He'll get his flannel quilt for his b-day in November. Meanwhile there's still a lot of work to do to finish it. And plenty of shirt parts to cobble together a backing. 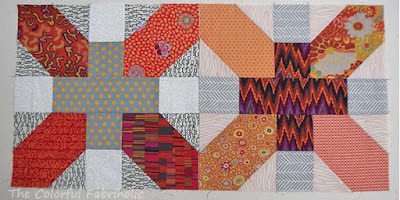 At our sew day I was also able to join almost all the rows of my batik spiral project. Just three more seams. Maybe it'll be a finished flimsy by Friday. Whoo-Hoo! Some of my bee friends are getting together tomorrow for a new day. Fun! I'll be able to continue working on my flannel plaid project. These projects should keep me busy! I had such a good time at camp with my friend Chrissy & her sister this weekend. Thanks, Chrissy! 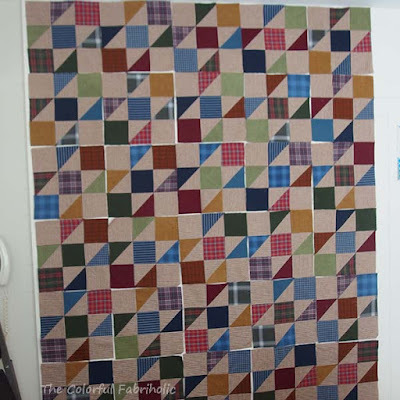 I got all the HSTs sewn and 16 blocks of my flannel plaid project made. This will be a birthday gift for my husband, due in November. I got bored making flannel blocks, so I pulled out the other project I brought along, my original Log Cabin Triangles blocks. Last year at camp Chrissy & I tried out various layouts, which you can see in this post (scroll down). Then I put the original LCTs aside to work on the Quilt of Valor ones with Gwen (here) and the ones for Alycia (here). So it's high time I got back to the original LCTs and set them together. Unfortunately I forgot to take my camera and just snapped a couple of badly focused phone pics. Here are Chrissy and Karen with my top. I'm undecided what to do with it from this point. It currently measures 54" x 63", not really a very usable size. There isn't any more left of these two periwinkle blue prints and two magenta prints. I have several options - let me know what you think. Finish it as is for a smallish lap quilt. To make it larger, find something that could work for a narrow stop border, then cut more of the low volume prints - I have plenty - for a piano keys border. More low volume logs would continue the theme to the edges. 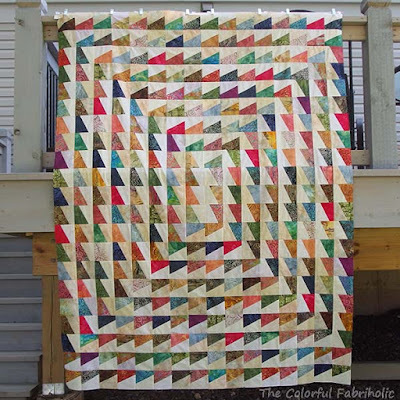 Find a bold print for a border to make it larger. Today I need to unpack and get caught up on household stuff, so I may not get any sewing done, we'll see. 2. Piece top for Christmas Tree project for 12 Days of Christmas in July. DONE. Also got the backing pieced. 3. Write & post Snake Quilt tutorial. Drafted but not posted. 4. 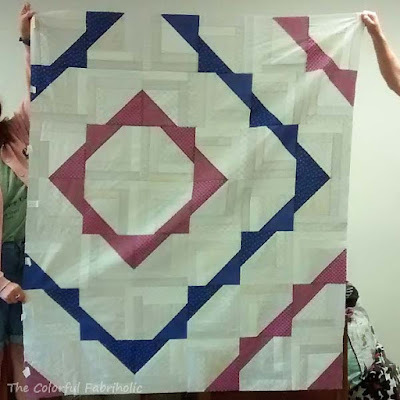 Bind Cherie's quilt from the boomerang patches. DONE. 5. If back from the long armer, bind KBFG. Not back from the long armer. She has it started but cannot finish it for awhile due to upcoming hip replacement surgery. 6. 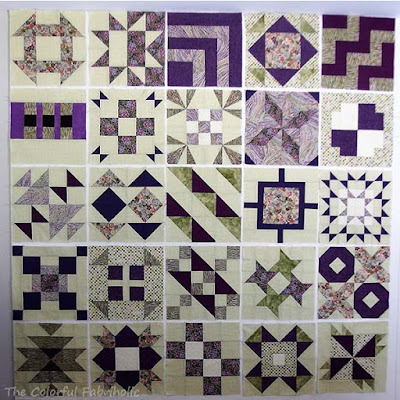 Work on WIVSP hand piecing project. Not touched. 7. Keep up with Solstice Challenge and bee blocks. DONE. Also made 3 x and + bonus blocks for a friend's special project. 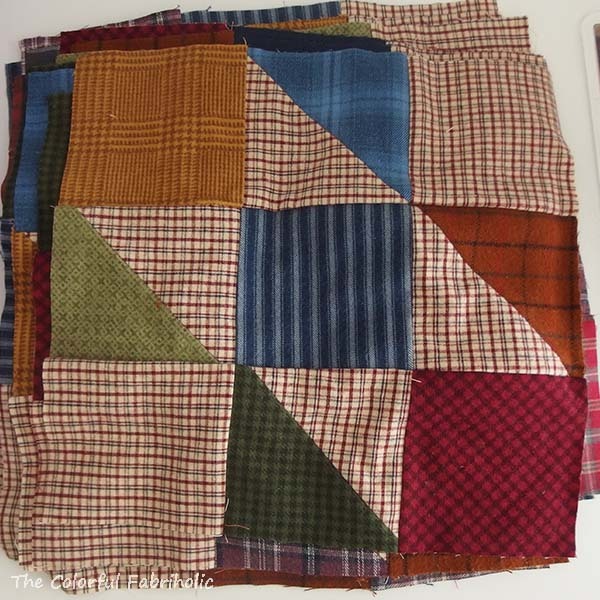 Other: 1) Cut and kitted flannel plaid project to piece at camp and sew days. 2) Advanced batik leaders & enders to a design on the wall, now partially sewn into rows. 1. Finish batik leader/ender project to a flimsy. 2. 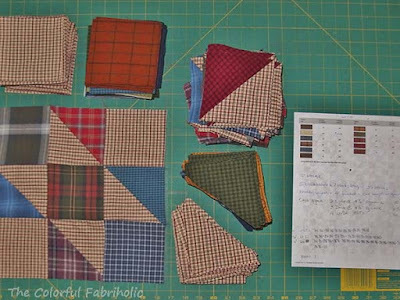 Make blocks for flannel plaid project. 3. 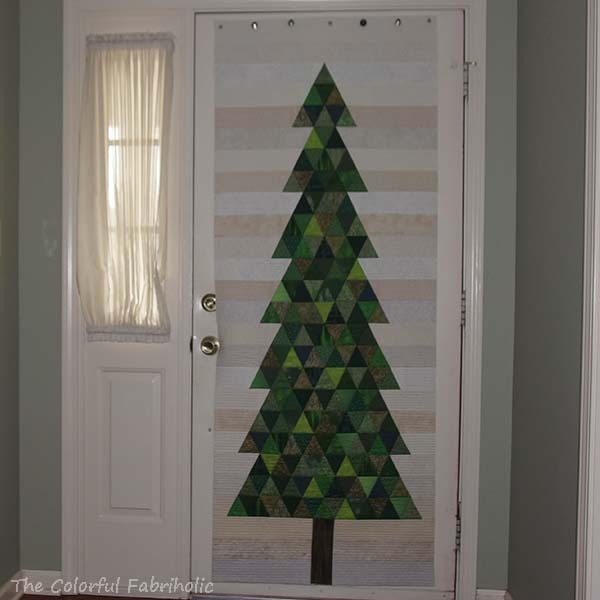 Layer, quilt, and bind Christmas tree project and begin stitching hanger loops. 4. Work on WIVSP hand piecing project. 5. Plan what to do with Solstice Challenge blocks. 6. Keep up with bee blocks and BOMs. 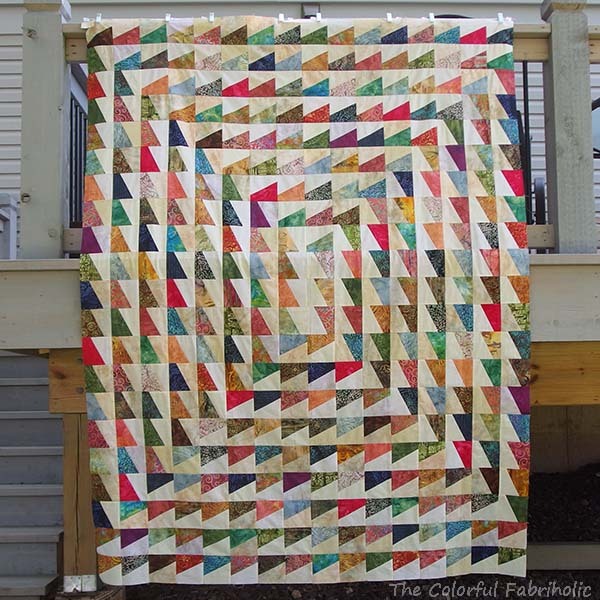 Linking up with the new Stash Report over at Quilt Paint Create. 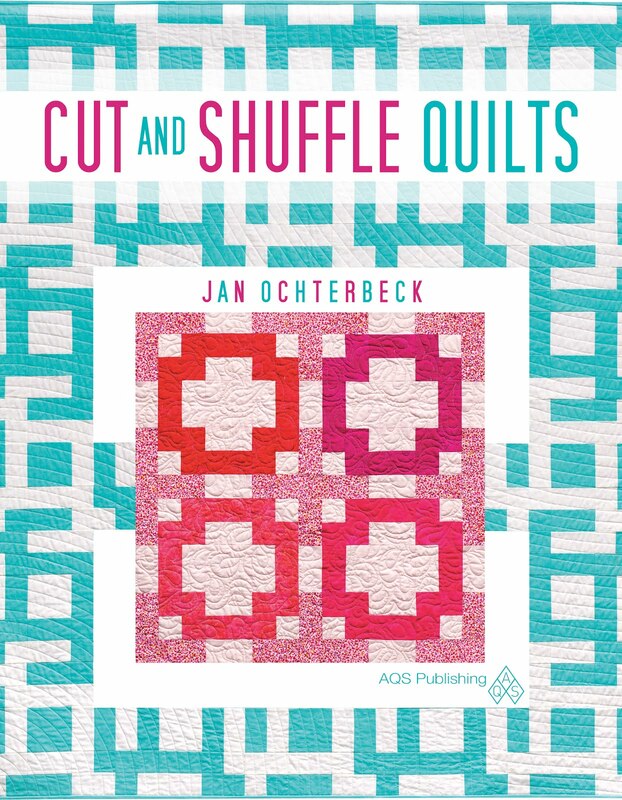 Judy L at Patchwork Times has retired from hosting the Stash Report, but since it helps keep me accountable, I'm still going to keep track of my stash. My friend Chrissy has invited me and a couple others to a private retreat at GS camp while she works as the camp supervisor this weekend. Thanks, Chrissy! Tools and equipment are all packed up and ready to go. Several projects are all kitted up, including my LQS BOM which meets tomorrow morning, my flannel plaid project, and a UFO that was put on hold last summer. Let's see how much I can accomplish. Of course, much of the fun of camp is just hanging out and gabbing all weekend. So whether I accomplish much or not really doesn't matter. So far the width has shrunk 6" with another 1-1/2" to go, for a finished flimsy width of 64". 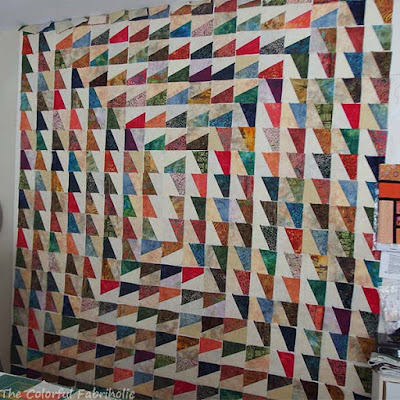 The length is still ceiling to floor, but it will shrink to 84" when the row seams are sewn. I am not taking this project to camp because it would be too easy to get the pieces out of place or turned in the wrong direction. This one is better off left on the big wall at home, and I have plenty of smaller projects packed that'll keep me busy.